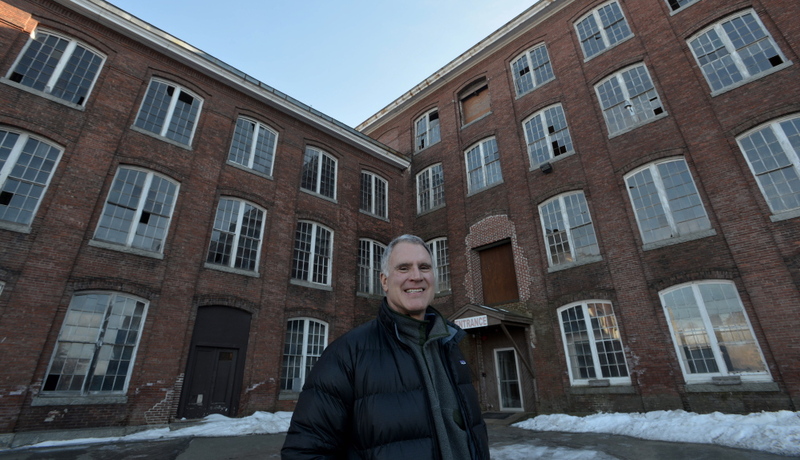 The Hathaway Creative Center developer plans a hotel and conference center in former mill buildings while Colby College explores downtown housing for students and staff. Staff photo by Michael G. Seamans Paul Boghossian, owner and developer of the Hathaway Creative Center, stands in front of the old Marden’s and CMP building at the Hathaway complex on Wednesday. 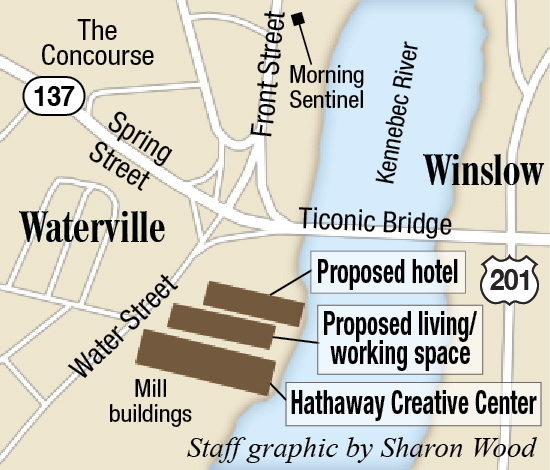 WATERVILLE — Efforts are underway by the developer of the Hathaway Creative Center and Colby College that could lead to more people living and working downtown, helping to spur economic development while enlivening the heart of the city. 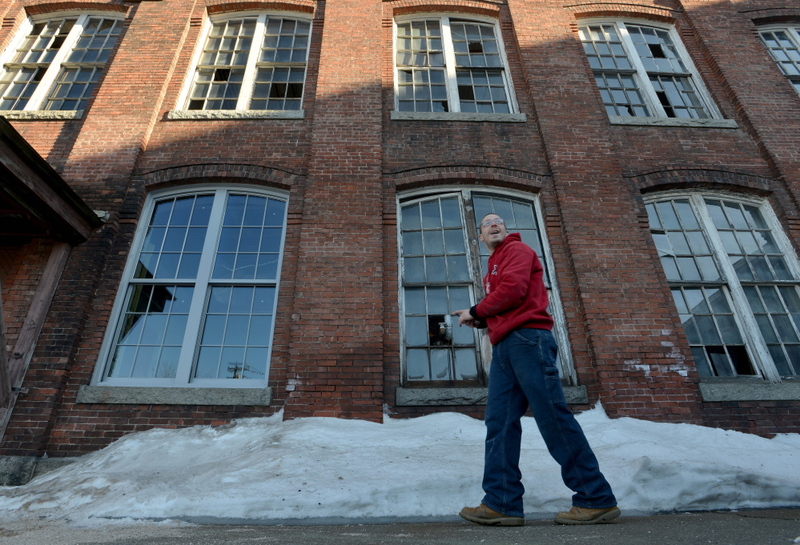 Paul Boghossian, the Hathaway developer, is working toward getting financing to develop two former more mill buildings in his Hathaway Creative Center complex off the north side of Water Street, while Colby College is looking at creating living spaces for students and faculty downtown. “There’s stuff percolating in Waterville that I think will raise the tide for everybody,” Boghossian said. Colby College is in the “exploratory phase” of its downtown plans, according to Colby spokeswoman Ruth Jackson. “We’re thinking about how to help make Main Street a more attractive place to live, work and shop,” she said. 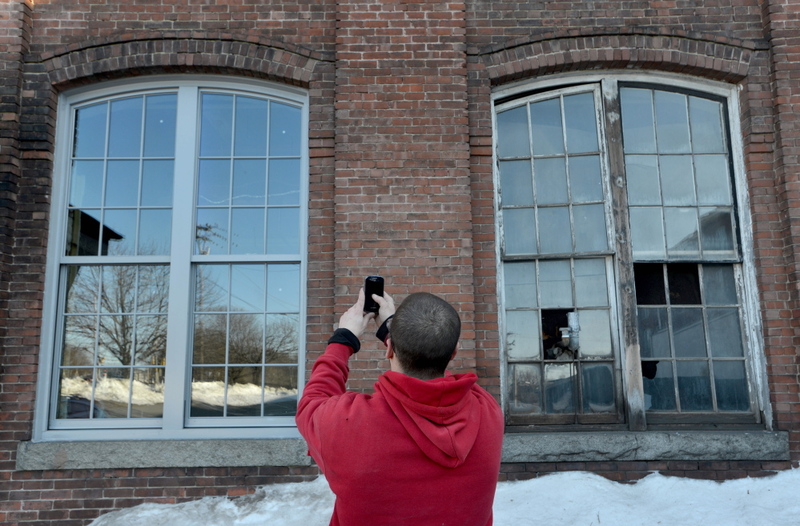 Last week, workers installed prototype windows in the former Marden’s Industrial and Central Maine Power Co. buildings that will be inspected by the Maine Historic Preservation Commission to make sure they meet historic standards before Boghossian replaces hundreds of windows in those buildings. Finishing those inspections will move the project forward, he said. Boghossian plans to develop live-work spaces and a conference center in the former CMP building adjacent to the Hathaway Creative Center and to develop a hotel and apartments in the former Marden’s building, which is closer to Bridge Street. A gathering space and cafe area between the CMP and Hathaway buildings and a sculpture garden between the CMP and Marden’s buildings are also in the works. Boghossian has talked about the plans in the past, saying in June 2014 he was poised to start development on the CMP building. Boghossian was referring to his southernmost building in the complex that he developed to the tune of $32 million and which is nearly full of workers and tenants. That project has thrived even during the economic downturn in recent years, he said. CEI, a private nonprofit financial institution based in Wiscasset, has already invested in the former CMP building and is also interested in the Marden’s building but has not yet invested in that project, according to Boghossian. “They particularly like the hotel planned for the Marden’s building because of the potential for jobs and for training and the logical fit with the hospitality program at Thomas College and the culinary program at Kennebec Valley Community College,” he said. Beyond CEI, several commercial banks have expressed serious interest in the construction financing, according to Boghossian. He said he is courting restaurants and a massage therapy business to move into the first floor of the Hathaway building. Now the Button Down Cafe and a sales office for a chemical company are on the first floor. A Women, Infants and Children (WIC) nutrition program office is on the second floor, as are MaineGeneral Health employees. MaineGeneral and Cengage, a publishing company, are located on the third floor. All told, about 350 MaineGeneral employees work in the building following moves in recent years. In addition, there are 67 apartments — all occupied — on the fourth and fifth floors. Monthly rents are $775 to $1,850 for the apartments, which began housing tenants in May 2009. By Christmas 2009, all of the apartments had been leased. There are no current vacancies. The Hathaway Creative Center building was a shirt factory that closed in 2003. Boghossian replaced more than 570 windows in that building at $4,000 a pop during its development. Boghossian, who is a Colby College alumnus, says he sees promising signs in the college’s interest as well as the effort by Waterville Creates!, a group that advocates for arts and culture in the city. Colby’s interest in residential housing for faculty and students downtown is especially exciting to Boghossian, who guesses that such housing could be for more than 100 students and perhaps 50 faculty and staff. Existing spaces could be rehabilitated to become living spaces, and possibly new residential spaces would be created, he said, and some may live in the Hathaway complex as well. Already, faculty and staff, including those from the Colby College Museum of Art, live in the Hathaway building, he said. Like Boghossian, Jennifer Olsen, executive director of Waterville Main Street, says one of the things that keeps a downtown vibrant is having people living there. Waterville is distinct in that a lot of people come into the city during the day to work, shop and do other activities, but at night there are significantly fewer people. She said she looks forward to exploring areas downtown that could serve as living spaces.